This will take you to the new Dashboard with a login pop-up. (Fig. 2) When you log out you will be left on the Client Portal page. Bookmark this Portal for future logins to your Crosswinds account. Once logged in through the Client Portal you will be at your Dashboard. (see Fig. 3) Most places you would need to find are right there in the drop-down menus. Some of the more important links are also at the bottom under “Quick Links”. If you have more than one domain use the “Domains” or “Account Type” links in the center to access specific account services for each domain. The only important place to which you will not find a direct link from your Dashboard is the Control Panel for your website. 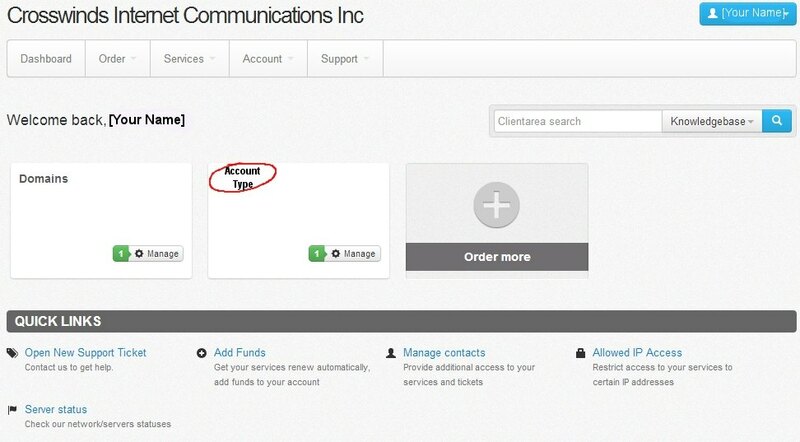 To find your Control Panel (aka “cPanel”) first click on the link to “Account Type”, shown circled in red on Fig. 3. The “Account Type” page (see Fig. 5) gives you access to the internal management of your website. Because each domain is managed separately, you need to click either the domain name or the button to the right with the gear (choose “Service Management”). Figure 6 shows the internal management page for a specific domain. 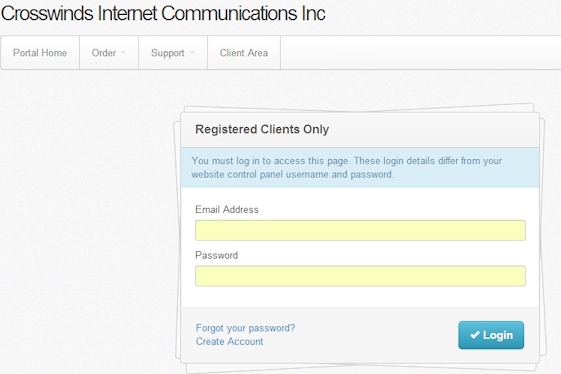 Click the “Access Control Panel” link shown circled in red. If you click on “Login Details” you will see a direct link to your Control Panel and the username for logging in. Control panel ( cPanel ) has its own login (username/password). Bookmark this link for quick access to your cPanel. You can also get to your cPanel by simply putting /cpanel on the end of your domain name. You may get a browser warning due to leaving your domain and going to our back-end for login, just check “accept it forever” – it is safe, and secure. For your security, be sure to choose a strong password for logging onto your site. Please read more about the importance of secure passwords. After logging into your cPanel, you can change your password by selecting “change password” in the “preferences” section near the top of the page. Once you are in the password change area, a handy chart will tell you how strong your password is. Remember, your passwords can never be too strong!